By default sample() randomly reorders the elements passed as the first argument. This means that the default size is the size of the passed array. replace=TRUE makes sure that no element occurs twice. The last line uses a weighed random distribution instead of a uniform one. 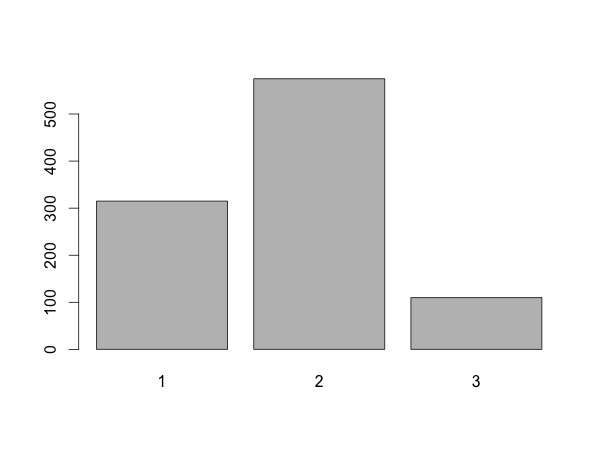 One out of four numbers are 1, the out of four are 3. This is the size of the returned list. If replace is disabled size must be no bigger than the length of the first argument. If this is true a sample may contain an element several times while another element might not occur at all. Allowing some elements to occur more than once lets you get a sample longer than the first argument. The prob=c(.30,.60,.10) cause 30% ones, 60% twos and 10% threes. The numbers don't have to add up to 1 - they don't in the example at the top of the page. Table sums up the individual items in the 1000-element list.